With the rack in the middle position, preheat the oven to 350°F (180°C). Butter and line two 8-inch (20 cm) springform pans with parchment paper. In a bowl, combine the flour, baking soda, baking powder and salt. Set aside. In another bowl, combine the eggs, sugar, buttermilk, oil and vanilla with a whisk. Set aside. In a small bowl, combine the cocoa powder and coffee with a whisk. Add to the egg mixture. Add the dry ingredients and stir until smooth. Spoon the batter into the prepared pans. Bake for 45 to 50 minutes or until a toothpick inserted into the centre of the cake comes out clean. Let cool completely before unmoulding. In a saucepan, bring the cream and corn syrup to a boil. In a bowl, pour the hot cream mixture over the chocolate. Let melt for 2 minutes. Stir until the ganache is smooth. Refrigerate for about 1 hour or until it has thickened and is still spreadable, stirring four or five times. On a work surface, cut and remove the rounded tops of each cake. Cut each cake in half horizontally to make four slices. With a spatula, spread the ganache evenly over the surface of each slice. Layer the four slices and place on a cake stand. This cake keeps well for up to 3 days at room temperature under a cake dome. Great Chocolate cake but bake time is 30 minutes. 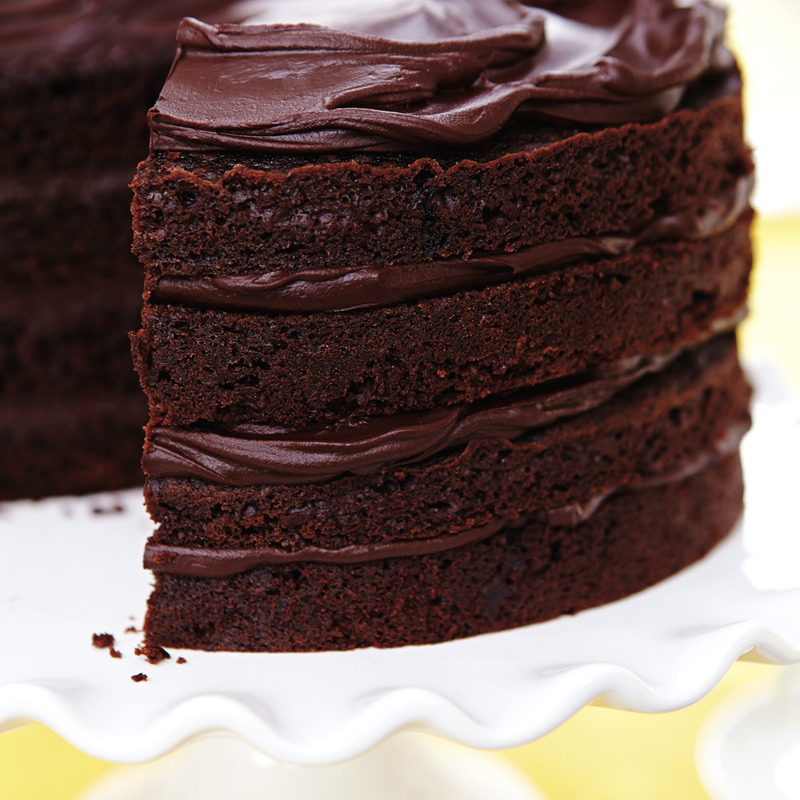 Such a simple recipe and had a great chocolate flavour and a moist texture. I'm making it again today! This cake is defiantly delicious, the flavour is a nice almost semisweet flavour. However I have to say the baking times seem way off. My instinct told me not to bake 45 minutes and so I set for 35. It was on the verge of overdone and dry at that point and I would recommend checking at around 28-30 minutes. Really easy to make and yummy. made it for my husband's birthday- he loved it!! This recipe is perfect. I did add chocolate chips to melt too. This is definitely one of the best chocolate cakes I've ever made - thank you so much for the recipe! It resembles one of my favourite chocolate cakes with apricot filling between the layers (similar to the famous Sacher torte) and it's definitely a recipe I will come back to. This cake is just perfection. I also baked it in a 10" spring form perfect fit, I buttered and floured did not bother with parchment and it turned out beautiful, right on time too I used a silver stone color/grey colour pan. Just a beautiful textured cake, thanks! I paired this with your buttercream recipe, #3 and I added a bit of caramel dolce about a tablespoon, so the flavour is kind of like those caramel machiatto coffees....if you want to fill it double the buttercream. Husband just said MMMMMM! 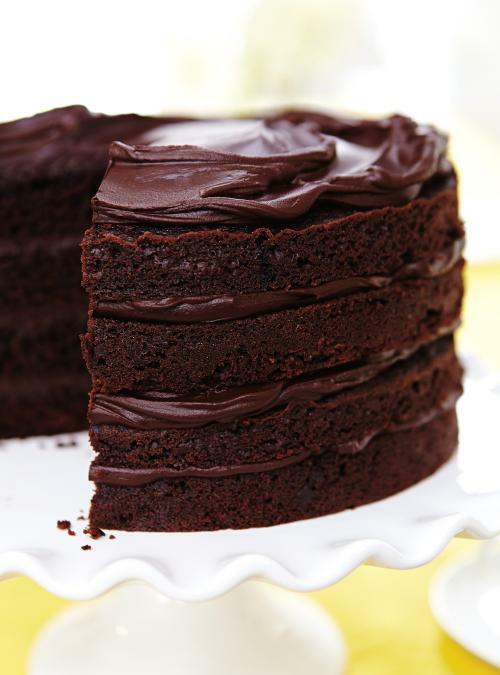 This IS the best chocolate cake. I didn't layer it but used a 10" springform pan. Took a bit longer to bake but it was a thing of beauty. Covered with ganache then let it set. I then used a pumpkin frosting to add some panache. Serves 12-16 depending on how big your slices are. Beautiful! I'm in abit of a bind. No 8 inch springform. Can I make it in a bundt pan?